This is our opportunity to describe the different activities we offer. There are many opportunities for every child to participate. Children in grades 3-8 were encouraged to attend the Cast-n-Blast at Champion Lake just west of Imperial, NE. There were sessions for Kayak Paddling and Fishing, Casting, Duck and Goose calling, and Archery. The kids had a lot fun. The Physical Education department at DCHS hit a bull's eye by applying for receiving a grant for archery equipment. Mr. Marty Hughes, P.E. teacher, saw an opportunity to better his program when he saw information about a grant on the Game and Parks website. "I thought it'd be nice to have," he said. "The archery program has been a fantastic and great success oriented activity for the kids, which creates excitement for this activity," said Hughes. It is a good learning experience for the kids and "it gives the students of our school another opportunity to be involved in activities that aren't out for sports." "Archery is way different than anything else we've done in class. 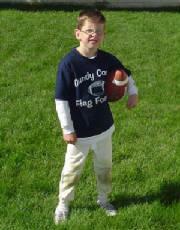 It is just fun," said senior lifetime sports student Matt Custer. Mr. Hughes plans to have a mother, daughter, father, son tournament in March because of the success of the unit in his classes. 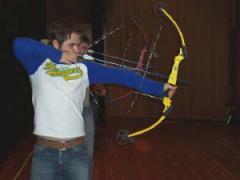 He also plans to start sharing archery with more classes, such as High School lifetime sports, the Junior High, and 4th& 5th graders. "Hitting a certain spot on the target consistently," said senior Philip Pankonin, is the hardest part." Lifetime sport students say that their favorite game is to play "battleship" on the targets, sinking the battleships by hitting the target (ship) a number of times. Archery has to be taught by a certified trainer. Mr. Hughes is a 2nd level trainer which means he can teach the class and train others to be trainers. "We were privileged to get the archery unit and grateful to the archery company who gave the state money. The physical education program has benefited," said Mr. Hughes.